ANKARA, 4 April (IRIN) - There is growing concern over the welfare of tens of thousands of children affected by a series of quakes in western Iran last week, which killed at least 66 people and injured over 1,000 more. "Preliminary indications suggest that 36,000 school-age children were affected in the two districts of Douroud and Boroujerd," Country Representative for the United Nations Children's Fund (UNICEF), Christian Salazar Volkmann, told IRIN on Tuesday from the badly affected town of Boroujerd in Lorestan province. "Fifty percent of the schools in Douroud and 25 percent in Boroujerd - a total of 130 schools - were destroyed, with others receiving light to moderate damage," Volkmann explained. "Schools that should have started today have not." Despite poor weather conditions, people were still encamped outside in school yards following reoccurring aftershocks - a total of 94 since Friday - he said, underscoring his concern over the psychological impact this was having on children. "We would like to restore a little degree of normalcy," the UNICEF country representative said. "Over the next few days, we are hoping to help the authorities here to restart some form of schooling and some kind of kindergarten as quickly as possible." On Monday, UNICEF dispatched 10,000 blankets and 300 tents to Lorestan province. In collaboration with the United Nations Educational, Scientific and Cultural Organization (UNESCO), the UN children's agency will also send a team of experts to the area on Wednesday to assess the educational and psychological needs of children. Based on that assessment, further resources would be mobilised to support the authorities with temporary educational facilities, supplies and toys. According to the Iranian Red Crescent Society (IRCS), at least 66 people have been confirmed dead and 1,246 injured after a series of moderate sized tremors occurred around the industrial towns of Doroud and Boroujerd on Thursday and Friday in Lorestan, measuring up to 6 on the Richter scale. "Some 150,000 people, or approximately 30,000 families, were affected by this quake," Mansooreh Bagheri, IRCS Programme Coordinator for International Cooperation told IRIN from Tehran. "Of the 330 villages affected, 47 were badly damaged". IRCS, which had relief teams on the ground shortly after the onset of the disaster, has already distributed tents, blankets, nylon sheeting, lanterns, canned goods and other basic living items to those affected. "The situation is under control. There is no need for international assistance," Bagheri confirmed. "Our distribution efforts are ongoing and the search and rescue part of the operation is now over." ICRS was now in the process of establishing mobile showers and latrines in affected communities, she said, adding some school-age children were returning to schools in makeshift classes now being erected in tents. Earthquakes are not unusual in Iran, which sits on some of the most active seismic fault lines in the world. On 26 December 2003, a devastating earthquake levelled the ancient city of Bam in southeastern Kerman province, killing over 43,000 people and leaving hundreds of thousands homeless. April 5, 2006 -- IN the present state of scientific knowledge, it is still impossible to forecast earthquakes. Nevertheless, we know which parts of the globe are most likely to be struck. And in the center of perhaps the most active of these zones is the Iranian Plateau - where at least one nuclear reactors is now under construction, with more planned. Over the past century or so, Iran has experienced more earthquakes than any other part of the globe - at least one tremor each day. Last week's earthquake in the south-central province of Lorestan is the latest reminder of that fact. Since Iran started properly recording earthquakes in the late 1940s, it has suffered at least one "big one" every decade: Torud (1950s), Boein-Zahra (1960s), Tabas-Golshan (1970s), Qazvin (1980s), Rudbar-Tarom (1990s) and Bam (December 2003). By official estimates, these earthquakes claimed the lives of 126,000 people, injured a further 800,000 and made 1.8 million people homeless. At times, the damage from one quake amounted to more than 7 percent of the nation's GDP. It is thus surprising that the safety aspect of Iran's nuclear program has received little attention. Inside Iran, the debate has been propelled away from real issues with the help of jingoistic slogans. Abroad, the accent has been put on security issues, with reference to the program's suspected military dimension. As far as I am aware, the safety issue has not been seriously raised either at the International Atomic Energy Agency (IAEA) or at the U.N. Security Council, which debated Iran's program last month. Yet the safety risk for the region is readily manifest. Even if the program has no military dimension, it would still be prudent to demand that it be put under a moratorium until this issue is fully, and publicly, debated inside and outside the country. The program began under the Shah in the 1970s; it was never explained to the Iranian public and never debated in the parliament. Several reports, including one by Stanford University, that expressed concern about locating nuclear power stations in earthquake zones were never published. Nor was there any public inquiry on how and why the Bushehr Peninsula - one of Iran's most quake-prone areas - was chosen as the location of the first nuclear power station. The spot, known as Hellieh, was once the site of half a dozen villages. It was abandoned in the 1940s when a major earthquake wiped the villages off the map. Nearby are the remains of Siraf, the region's most important port until it was destroyed in earthquakes in the 10th and early 11th centuries. The English-language daily of Tehran, Kayhan International, raised concerns about the location of the nuclear plant in 1977. The German consortium (headed by Siemens) charged with building the plant, answered with a promise to commission a special study. But that promise was never fulfilled; building proceeded with no proper assessment of earthquake risks. The project was 75 percent complete when the revolt of the mullahs began in Iran in 1978. The Germans abandoned the work, and Iraqi airstrikes destroyed what had already been built in the 1980s. When the program was revived in 1989, it was the turn of Tehran University's Geophysical Centre to raise concerns on grounds of safety. A study was commissioned by then-President Hashemi Rafsanjani in 1993 and completed in 1995. It has never been published, but parts have leaked - warning that the plant, as designed, might not withstand tremors of 7 or more on the Richter scale. An official Iranian government report at a 2005 international conference in Kobe, Japan, puts the area where the nuclear plant is located at the center of the country's most active earthquake zone. Other facts make the safety issue even more pressing. First, no proper assessment was ever made of the damage done to the half-built plant before building was resumed in the year 2000. Siemens and its partners have refused to hand over the initial plans, so the new contractors, a consortium of Russian firms, have been obliged to proceed mostly by guess work. In June 2000, a number of Iranian nuclear scientists wrote to then-President Muhammad Khatami, expressing concern that a hasty mixture of German and old Soviet designs and building methods might not be a good idea. They received no reply. Second, there is, as yet, no agreement on how and where to treat the waste water produced by the Hellieh plant. Early plans to just let it flow into the waters of the Gulf could pose a major ecological threat - wiping out the region's fishing industry and/or threatening the desalination plants used by many Gulf states to produce up to 80 percent of their water. Nor is there yet agreement on what to do with the plant's nuclear waste. Under both the shah and the mullahs, Iranian decision-makers have been fully aware of the risks involved in building nuclear plants - and so chose to locate them in sparsely populated areas. That strategy, however, did not take into account Iran's neighbors in the western coast of the Gulf and the Gulf of Oman - where 40 percent or more of the population lives close to the perimeter of danger. The Islamic Republic has decided to build seven of the nuclear stations planned under the shah. The second will be located at Dar-Khwain on the River Karun, which flows into the Gulf via the Shatt al-Arab. The third will be built in the Jas Peninsula almost opposite the Mussandam Peninsula in Oman. The world needs to put at least as much importance on the safety aspect of the Iranian nuclear program, which is readily manifest, as on its security aspect. Building nuclear power stations, especially when designed by Russians and Chinese firms that are subject to no international scrutiny, on the world's most active earthquake zone might not be the best of ideas either for Iran or its neighbors. Amir Taheri was the executive editor of the Iranian newspaper Kayhan before the revolution. He is a member of Benador Associates. Iran Press News: Translation by Banafsheh Zand-Bonazzi. Based on three reports here, here and here. The inhumane Islamic regime not only has not come to the aid and assistance of the victims of the Friday, March 31st earthquake in the province of Lorestan, it has also viciously attacked and beaten a number of those who complained and protested the lack of relief. The regime-run news agency IRNA reported: "A group of the earthquake victims gathered, on Saturday afternoon, in front of one of the regime's relief centers protesting the lack of relief and demanding assistance such as food, tents and medical care for their families." Mehdi Hashemi, a deputy of the Ministry of Interior of the Islamic regime who traveled to Boroujerd, one of the cities hardest hit in the earthquake, admitted that the protestors had in fact been arrested. He called the hungry and afflicted victims of the earthquake �agitators and hoodlums� and said: "those who were selfish and wanted to disrupt the order were arrested. We will make full use of all security and disciplinary forces including the revolutionary guards, the Basij and the army in order quash any unrest." The Islamic regime has also closed all the roads and has announced that no private citizen is permitted to deliver any assistance to areas hit by the earthquake. The shelterless survivors also now have to endure snow and high winds, as well as floods. The Deputy mayor of the city of Borrower, in an interview with the regime-run news agency MIRASS, denied all of the regime's boasts in having mobilized assistance groups and aid packages. He added: "250,000 people are without homes or shelter and we require 30,000 tents and so far we have only received all of 2000. We have also only received 400 heaters (meaning 625 people to one heater); the victims are wrapping themselves in plastic to sleep. If things continue in this vein thousands of people will freeze to death." It is reported that the earthquake destroyed 43,000 residences in the city of Boroujerd and the town of Odorous. There is still very little known of the damages sustained in the surrounding villages and rural areas. The latest reports indicate that those who died in the earthquake and whose bodies have not as of yet been dug out from underneath the rubble [due to a lack of machinery] have begun emitting a stench which threatens to lead to all kinds of diseases and infections in the area. The regime-run site AFTER, quoting Moshe Yeshiva, the representative of Borrower to the Males (The Islamic Parliament's Assembly) wrote: "The Hialeah Hammer - The Islamic Republic of Iran's Red Cross - in this situation has not only not assisted the victims of the earthquake, it has in fact acted against their well-being as well.� Received reports indicate that in a repeat performance of the December 2003, Bam earthquake, this organization has not only prevented all assistance from reaching people who are in need of relief, it has begun robbing all cash or donations of food, heaters and other items, in order to either pocket or sell on the black markets for the proceeds to be embezzled by various Mullahs. Just before dawn on March 31, 2006, a strong earthquake struck near Silakhor, Iran. The magnitude 6.1 earthquake killed at least 66 people, injured at least 1,280 and damaged buildings in 330 villages surrounding the epicenter. It is likely the death toll would have been much higher if residents had not been warned by a series of weaker foreshocks. This shaded relief image shows the topography of the earthquake region. Low elevations are green, with yellow, pink, and white representing progressively higher elevations. The earthquake was located 7 kilometers (about 4 miles) beneath the surface. Although the earthquake fault can not be seen on the surface, the topography hints at the geology of the region. Iran is located on top of the collision zone between the Arabian Plate (to the southwest) and the Eurasian Plate (to the northeast). A reverse fault (a fault in which land on one side is pushed up during earthquakes) called the Main Zagros Reverse Fault divides the two plates. The Arabian Plate is moving northwards at 25 millimeters (1 inch) a year (about the rate fingernails grow), compressing the Eurasian plate. Earthquakes release the pressure created as the two plates grind together. Over millions of years the collision raised the Zagros mountains over 4,000 meters (13,100 feet), and shifted river valleys more than 50 kilometers (31 miles). The Silakhor earthquake occurred on a section of the Main Zagros Reverse Fault called the Main Recent Fault. The Main Recent Fault separates the accordion folds of the Zagros Fold Belt (lower left) from the High Zagros (upper right). The Zagros Fold Belt is a region of sinuous parallel mountain ranges created by the compression of the margin of the Arabian and Eurasian Plates, similar to the folds created by pushing the edges of a fabric sheet together. In contrast, the High Zagros are comprised of a block of the Eurasian plate that has been uplifted by the oncoming Arabian Plate. Stresses created by this earthquake will likely lead to more quakes nearby in the coming decades. All this is happening while Iran is spending hundreds of millions of dollars a year promoting the cause of Arabs and Arabo-Muslim terrorist organizations such as hammas. The current regime is not Iranian, after all. It is Arabo-Islamic, and its loyalties and priorities lie with serving the Arabo-Islamic cause, not with Iran. Iran itself is just a commodity for them; a very profitable commodity. 1. Iran�s economy is in shambles, which has led to an astronomical unemployment rate, while the majority of those employed are living below poverty. 2. 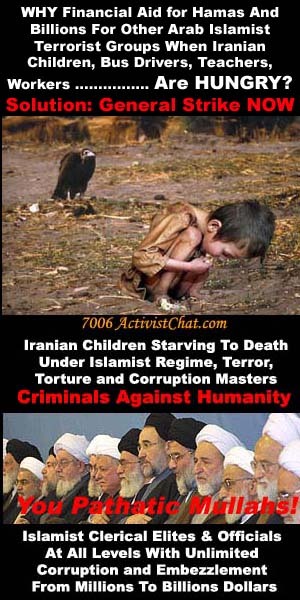 Hunger, poverty, and homelessness run rampant in Iran, leading to countless deaths of Iranian adults and children. 3. The drug abuse rate in Iran is skyrocketing and deemed as one of the worst is the world. 4. Prostitution is widespread out of necessity, and destroying the mothers and daughters of Iran both physically and psychologically. 5. Because of the above, HIV / AIDS is also rising rapidly. 6. The infrastructure is in disarray, and the poor state of road and traffic conditions has caused countless unnecessary deaths. Iran has one of the worst traffic related death rates in the world, if not the absolute worst. All this is happening while Iran is the holder of the second largest oil reserve in the world. JERUSALEM -- A senior Iranian official on Wednesday pledged to provide financial support to a Hamas-controlled Palestinian Authority, which is already in budgetary difficulties and facing further cuts in aid. "We will definitely help this government financially in order to resist America's cruelty," said Ali Larijani, the secretary of Iran's Supreme National Security Council, referring to the Palestinian Authority. He spoke in Tehran after meeting with the senior Hamas political leader, Khaled Mashaal, but provided no details or figures about what kind or level of support oil-rich Iran would provide. Israel has already blocked about $50 million a month in customs and tax receipts collected for the Palestinian Authority, leaving it with a monthly budget deficit of $110 million. The United States and Israel contend that Iran already helps to finance Hamas, though the Iranians deny it. Israel responded by saying that it would be "entitled to use all legal means" to block the flow of Iranian money to "a terrorist leadership" of the Palestinian Authority. The U.S. and the other members of the so-called quartet trying to foster peace negotiations between Israel and the Palestinians -- the European Union, Russia and the United Nations--have demanded that Hamas recognize Israel's right to exist, forswear violence and accept previous Israeli-Palestinian agreements. If not, it faces isolation and sharp reductions in budgetary support, with financing for aid groups continuing only if it does not benefit the Palestinian Authority. But the quartet has agreed to finance a "caretaker" Palestinian government until Hamas forms a government, which could be weeks away. European Union and UN officials are talking about seeing the Hamas government's program before moving to cut off money. Mashaal has been touring Muslim countries asking for financial aid for the Palestinians. On Monday, Iran's supreme religious leader, Ayatollah Ali Khamenei, called on Muslim countries to give the Palestinian Authority annual funding as a means toward spiritual unity. President Mahmoud Ahmadinejad of Iran, who has called for Israel to be wiped off the map, hinted Monday after meeting Mashaal that Iran would provide overt funding. "Since the divine treasures are infinite, you should not be concerned about economic issues," he told Mashaal, the IRNA news agency reported. Mark Regev, a spokesman for the Israeli Foreign Ministry, said Israel would try to stop Iranian money from reaching a Hamas-led Palestinian Authority. "We would be entitled to use all legal means to prevent that money reaching terrorists," Regev said. He said that the new Palestinian leadership "has to decide if it wants to be part of the legitimate international community or if it wants, through its own actions, to align itself with international pariahs." In Gaza City, Hamas leaders held talks Wednesday with the defeated Fatah faction, which said it would keep trying to find "common ground" with Hamas and could take some seats in a new government. Fatah has said it would remain in opposition, but Azzam al-Ahmad, the leader of Fatah's parliamentary faction, said, "We are in a dialogue that has only just begun, and we want to find common ground and we hope we will seal an agreement." But Fatah is insisting that Hamas accept President Mahmoud Abbas' program of negotiations with Israel and only peaceful resistance to Israeli occupation. Mahmoud Zahar, the leader of the Hamas faction in parliament, said, "There is an intention by all factions to participate in the coming government, including the brothers in Fatah." Iran has announced that it was giving 50 million dollars in aid to the cash-strapped Hamas-led Palestinian government following a suspension of funding from the United States and European Union. TEHRAN, Iran - Iran will give the financially strapped Palestinian Authority $50 million in aid, state-run television reported Sunday. Iranian Foreign Minister Manouchehr Mottaki announced the aid package during a conference held in Tehran in support of the Palestinians. TEHRAN -- Iran may win Arab friends by pledging 50 million dollars to the cash-strapped Palestinian Authority, but at home the Islamic Republic's largesse received a mixed response on Monday. "I wish they had thought of the likes of me before they went lavishing Iranian money on others," said Farideh, as she sought donations in a south Tehran street to buy her dead son a gravestone. "Do the Palestinians look more needy than I do?" said the 65-year-old, who like others asked for her full name not be used when criticizing the government on a sensitive political issue. Foreign Minister Manouchehr Mottaki, speaking at a conference on the Palestinian cause in Tehran, said on Sunday his government was giving million to the Palestinian Authority to fill gaps left by Western aid cuts. The Islamic Republic has long championed the cause of fellow Muslims in the Palestinian areas, and some analysts say the latest move is part of a diplomatic effort to win regional backing in its nuclear dispute with the West. But the Palestinian issue does not stir the same popular emotions in non-Arab Iran as it does in nearby Arab states. "As they say, a lantern that can light your home, should not be donated, even to the mosque," said 60-year-old retired government worker Kourosh, adding that the Iranian government would be better spending its money at home. Such indifference is partly because the opinions of many Iranians are still colored by a bloody 1980-1988 war with Iraq, which was supported by other Arab states, and a history of enmity with Arabs before that. But also many Iranians are too busy with their own problems, as they struggle to find work or feel the pinch of inflation, even as the world's fourth largest oil exporter enjoys surging revenues amid high oil prices. "Why didn't they (the government) announce anything (before) but kept it for the holiday?" said 32-year-old Hassan, referring to Sunday's public day off. "I think they knew people would have asked questions if they heard clearly about the donation." Not everyone agreed with such sentiments. "There is no one else in the world who stands up to help the Palestinians, so we stand up for them as a Muslim nation standing up for its Muslim brothers," said 29-year-old Mohsen Moradi, a street hawker selling bootleg DVDs. A Hamas official, who asked not to be identified, told Reuters in Dubai that Iran was donating $100 million rather than $50 million but Iranian officials had no immediate confirmation. One analyst said the government may have played down the value for fear of an adverse reaction and said some Iranians worried the step would further isolate Iran, which the West says is seeking atomic bombs although Tehran denies this. The West says Iran is seeking to build an atomic bomb under the cover of a civilian nuclear program, a charge Iran denies. "They (Iranians) believe that helping an extremist group like Hamas would contribute to the world's suspicion that Iran is a terrorist state," said the analyst, who also asked not to be identified. Washington, which accuses Iran of sponsoring terrorism, and the European Union froze aid to the Hamas-led government because the group did not comply with their demand that it recognize Israel, renounce violence and abide by interim peace agreements. A moderate earthquake shook southeastern Iran Sunday morning, slightly injuring more than 70 people, state radio reported. The magnitude 5.2 quake hit near Zarand, 600 miles southeast of Tehran. The radio report said rescue teams were deployed. Zarand Gov. Hasan Rahamani told the radio panic struck when the quake hit, damaging some buildings. "People poured into the streets out of fear. Unfortunately the quake damaged some buildings. It knocked down walls and some roads were also damaged," Rahamani said. He said most of those hurt were treated for minor injuries and released from the hospital. In February 2005, at least 612 people were killed and more than 1,400 injured by a magnitude 6.4 quake in Zarand. Several surrounding villages were leveled and thousands left homeless. In March, three earthquakes and nine aftershocks struck western Iran in quick succession, killing at least 70 people and injuring about 1,200. Iran is located on several seismic fault lines and at least one slight tremor is felt each day. Posted: Thu May 31, 2007 5:21 pm Post subject: CORRUPTION TO THE MAX! Below is the article published in Entekhab News Line. It talks about a so-called smuggler named Hamid Bagheri Darmani. In reality he is no smuggler. He is a thief who has stolen (are you ready for this?) One Billion one Hundred Fifteen Million USA Dollars from Iranian people purse ($1,115,000,000)!!!! This is how his scam was working (typical of what all Mullah's have done. Currently without government funds injection, all Iranian Banks are bankrupt), He would submit a plan to Build an assembly Plant making Mercedes Benz cars and trucks in one of many industrial zones in the country. Then, he would get 100% financing, through Term Payment Letters of Credit to Dubai banks. In Dubai he would discount the Term Letters of Credit by 5 to 10% and cash in the money transferring it to Singapore, Canada and even US banks. Now, someone please tell us he was able to get bank financing by himself! He had no Mullah's supporting his dirty deeds. He was only a front for Mullah's! This is only the tip of the iceberg! We have mentioned there is 300 to 400 Billion Dollars of such stolen funds in UAE Banks! This corruption to the maximum must stop. Mullahs must go. Iranian people wish total regime change. Dear Nokar Mullah apologists. Any comment? Would you like to defend his acts? Do you like to divulge his Mullah backers? Why you never wish to talk about these issues? Why are you silent? خبرگزاري انتخاب : در پی انتشار خبر دستگیری بزرگ ترین قاچاقچی شناسایی شده در ایران به نام " حمید باقری درمنی" با پیگیری های انجام شده اطلاعات جدیدی درباره وی به دست آمد . در پی انتشار خبر دستگیری بزرگ ترین قاچاقچی شناسایی شده در ایران به نام " حمید باقری درمنی" با پیگیری های انجام شده اطلاعات جدیدی درباره وی به دست آمد . به گزارش سرویس اقتصادی خبرگزاری انتخاب به نقل از روابط عمومی ستاد مرکزی مبارزه با قاچاق کالا و ارز , حمید باقری درمنی پس از صدور حکم ضبط کالاها و جریمه حدود 13 میلیارد ریال , تلاش وسیعی آغاز کرد تا به کمک عوامل خود با جابجایی برچسب ها و کارتن های کالاها از ضبط کالاهای قاچاق خود جلوگیری کند . برابر اطلاع واصله نام گروه شرکت های حمید باقری درمنی جزء فهرست اعلامی رئیس دیوان محاسبات کشور است "که بانکها از دادن تسهیلات به او منع شده‌اند" و اخبار رسیده حاکی از فشار چند تن از قانوندانان قانون شکن به رئیس دیوان محاسبات برای بازپس گیری نامه یاد شده است . باقری درمنی باادعای احداث کارخانه تولید خودروی لوکس به اندازه "بنز و بی‌ام و" در گرمسار و نصب سوله واشتغالزایی برای 1500 نفر اقدام به اخذ 60 میلیارد تومان وام و سپس مکان یاد شده را تبدیل به انبار اجناس قاچاق کرد. در زمان دومین دستگیری وی به حکم بازپرس گرمسار و نیابت اعطایی به دادسرای تهران‌, با مقاومت دو و نیم ساعته و جلوگیری از اجرای حکم , باقری درمنی در ساعت 11 شب دستگیر و به پلیس آگاهی تهران بزرگ منتقل شد , اما فردای آن روز به رغم صراحت حکم بازپرس گرمسار مبنی بر تفهیم اتهام نامبرده و صدور قرار بازداشت موقت , بر خلاف مقررات جاری آیین دادرسی با اخذ تعهد اخلاقی از متهم به قاچاق حدود 9 میلیارد ریال , وی را آزاد می‌کنند . در ادامه گزیده ای از نامه رئیس دفتر هماهنگی و نظارت هیات های رسیدگی به تخلفات اداری به وزیر اقتصاد و دارایی در خصوص نامبرده آمده است :"حمید باقری درمنی طبق مستندات موجود رقمی بالغ بر " بیست هزار میلیارد ریال " اعم از ریالی و ارزی به نظام بانکی کشور بدهکار است که عمده دریافتی های نامبرده بازگشایی بی ضابطه LC از سوی بانک های عامل و براساس زد و بند بابرخی کارکنان بانکی بوده است. در این میان تخلف برخی از آنان محرز است و طبق پرونده‌های تخلفاتی در یکسال اخیر و در دوره مدیریت جدید وزارتخانه از بانک اخراج شده اند, اما ابعاد پرونده به گونه ای است که در صورت قصور و کوتاهی می‌تواند پیامدهای سنگینی برای نظام در پی داشته باشد . تاکنون نامبرده یک میلیارد و یکصد و پانزده میلیون دلار تسهیلات ارزی از بانکها و 100 میلیون دلار نیز از حساب ذخیره ارزی دریافت کرده که تعهدات پرداخت آن با بانک های داخلی و عمدتا بصورت یوزانس بوده است ". تمام بررسی ها نیز نشان می‌دهد که نامبرده به هیچ یک از تعهدات خود درقبال بانک ها عمل نکرده است . ایجاد سپرده به نام خود و اعضای خانواده و سوء استفاده از اعتبارات سپرده برای کسب اعتبار شرکت های زنجیره ای غیرفعال از دیگر شگردهای اخذ تسهیلات کلان بدست باقری درمنی بوده است . از سوی دیگر تمام فعالیت های نامبرده در زمینه قاچاق کالا , پولشویی وایجاد دفاتر بازرگانی در کشور امارات بوده است که متاسفانه با نفوذ در گمرکات خرمشهر , سلفچگان , چابهار , سیرجان و جنوب تهران و زد و بند با برخی مسئولان گمرکی مرتکب تخلفات گسترده در زمینه واردات کالا شده است . هم اکنون چند محموله بزرگ از کالاهای قاچاق شده بدست باقری درمنی وعوامل مربوط با تلاش وزارت اطلاعات کشف و ضبط شده و نامبرده تحت تعقیب قضایی است. یاداور می شود, باقری درمنی دارای پرونده های قضایی مفتوح در زمینه قاچاق کالا و پولشویی با ارزش میلیاردها تومان و پرونده های معوقات بازپرداخت وام های بانکی و قاچاق شمش طلا از سال 83 به بعد است . با توجه به اینکه وجود اینگونه عناصر مخرب در عرصه اقتصاد و خروج سرمایه‌ها به خارج از مرزها از جمله آسیب هایی است که نظام جمهوری اسلامی راتهدید می کند و حذف اینگونه عوامل مخرب و آسیب زا و احقاق حقوق از دست‌رفته نظام بانکی کشور نیازمند توجه و پیگیری ویژه است , ستاد مرکزی مبارزه با قاچاق کالا و ارز امیدوار است با درایت و هوشیاری مسئولان دلسوز قوه قضائیه با نامبرده به عنوان مفسد اقتصادی و بزرگترین قاچاقچی‌شناسایی شده در کشور برخورد قاطع شود . AEI has launched a major project to gauge the depth and breadth of Iran's economic ties with the outside world. "Global Investment in Iran: Interactive" is a new Web tool that documents major financial transactions with the Islamic Republic since 2000. Foreign investment in Iran is a subject of debate: some argue that such investment legitimizes the regime in Tehran, making it more difficult for free countries to confront it; others believe foreign investment can open up Iran by cementing it in the global commercial system. Ultimately, constraints on investment in Iran may provide the only leverage short of military action to derail Iran's nuclear weapons program. Organized in an innovative Flash presentation designed by AEI's Elizabeth Roodhouse, the data in "Global Investment in Iran: Interactive" are based on open-source reporting and are organized by country, economic sector, company, and financial institution. AEI researchers have documented more than 300 transactions amounting to more than $150 billion. A multicolored world map indicates which countries are most active. For each country, users can sort deals, financing, and investments by five economic sectors, by the type of company making a deal, and by year. The database also offers analysis of investment in Iran, examining trends and ranking countries by the total number and monetary value of transactions. The project was introduced at a conference on May 9. AEI's Omeed Jafari, the lead researcher on the project, explained its operation and rationale to the audience of journalists and Middle East specialists. Speaking about the "caricature of the foreign policy debate on Iran," Danielle Pletka, AEI's vice president for foreign and defense policy studies, argued that the two options into which the debate is distilled--diplomatic engagement and military action--leave an important gap. "Iran is deeply tied to the rest of the world, and highly dependent on the world trade and finance system." But it is important, she said, to get companies and investors thinking about the risk involved in investment in Iran. This will also send a strong message to Tehran about the economic costs of its inflammatory foreign policy. Pletka added that "Global Investment in Iran: Interactive" is simply a resource for debate, not a platform for advocacy. Patrick Clawson of the Washington Institute for Near East Policy spoke about the Iranian economy. "Iran is doing well because of oil," he said, but Iran spends 25 percent of its gross domestic product on energy subsidies, more than it earns for gas and oil exports. Tehran is low on cash, he added, and it can only stay afloat if the price of oil stays above $65 per barrel--which he predicted will not happen. According to Clawson, foreign investment in Iran masks fundamental problems in its economy. Rising unemployment--the issue which led to President Mahmoud Ahmadinejad's election--threatens the current government's hold on power, which leads the government to introduce more distortions into the economy. Native Iranian wealth is being relocated to regional financial centers like Dubai. Clawson concluded that Iranians, frustrated by Ahmadinejad's unfulfilled campaign pledges, are prepared to believe that his spurning of the West has caused Iran's current economic weakness. Iran's elite Islamic Revolutionary Guard Corps (IRGC) has been heavily involved in projects that draw foreign investment, said A. William Samii of the Center for Naval Analyses. Forty thousand of the IRGC's 120,000 members are involved in construction projects. "The IRGC has received a number of no-bid contracts to build pipelines," Samii said, which seemingly runs counter to Ahmadinejad's anticorruption political platform. The IRGC is heavily dependent on the foreign investment now tracked by AEI. What would you do when faced with a cash flow problem? You might try to curb expenditure, work harder to earn more, borrow money, or, when all else fails, put up the family jewels for sale. The latter is precisely what President Mahmoud Ahmadinejad�s administration is trying to do as it faces a cash shortage. Signs that the government may be running out of money have multiplied in recent months. Tens of thousands of civil servants, including school teachers, have not been paid since January. Bills from private contractors working for the government are piling up, threatening the survival of many businesses. The key oil industry, which accounts for more than 75 per cent of the government�s income, is being starved of cash. Efforts to attract some $15 billion in foreign investments in the oil and gas industries have borne no fruit. Foreign investors are wary of violating United Nations sanctions or running afoul of the US Treasury�s plans to put the financial squeeze on the Islamic Republic. All this may seem surprising if only because Iran has earned almost $150 billion from oil exports since Ahmadinejad won the presidency in 2005. So, were did the money go? Part of the answer lies in the hike in inflation rates. According to the Central Bank of Iran (CBI), monthly inflation rates since January 2006 have varied between 2.8 and 3.2 percentage points, making for an annual rate that could reach the 30 per cent mark next year. Theoretically, in an oil-based economy the government has a built-in interest in inflation. The problem, however, is that Ahmadinejad has presided over a massive increase in public expenditure. Part of this is due to an estimated 21 per cent rise in the budgets of military and security services in preparation for a war with the United States . Another big expenditure item is the ever-lengthening list of handouts by Ahmadinejad during his tours of the provinces - mockingly known as �The Ruin the Economy Road Show�. According to estimates, some $10 billion has been pumped into pork-barrel projects that often fuel inflation further. Ahmadinejad has also increased expenditure on his so-called �exporting the revolution� programme. Syria has received almost $3 billion in cash and cut-price oil. The Lebanese branch of Hezbollah has been rewarded with $1.8 billion while the Palestinian Hamas movement has collected almost $1 billion. A further $3 billion has been spent on financing anti-US political and armed groups in Iraq and Afghanistan . The government has also made provisions worth $4 billion to cope with emergencies in its quest to dominate Iraq in case the Americans run away. The biggest rise in public expenditure, however, has come from increases in imports, as the government tries to stockpile �strategic goods� in anticipation of war with the US . Iran buys more than half of its food and some 42 per cent of its gasoline from abroad, and is now busy importing as much as it can to beat future sanctions. Iran�s industries also depend on imports of foreign raw material, parts and technology. Iranian imports from Germany, for example, have risen by some 17 per cent since 2005. Because of rising political tension many of Iran �s trading partners are exacting higher prices and demanding cash on delivery. Fears that the nation�s economy may be heading for the rocks prompted 57 of Iran �s best-known economists to publish an open letter to Ahmadinejad, warning that his policies were making for disaster. The letter, circulated and widely discussed throughout the country, forced Ahamdinejad to invite the signatories to a debate. In the event, some 40 economists turned up but there was no debate. Instead, Ahmadinejad treated them to a gallimaufry in which obscurantist religious beliefs were mixed with half-understood economic concepts. He told the critics that his administration feared no economic meltdown for two reasons. The first was that the �Hidden Imam� would not abandon �the world�s only truly Islamic regime,� at a time it faced a war with the American �Great Satan.� The second was that the government was launching a massive privatisation programme to raise billions of cash. The economists had no comment about the role that the �Hidden Imam� might play in the Iranian economy. But they were critical of Ahmadinejad�s privatisation programme that they described as �a cover for bestowing free gifts on a few hundred individuals.� The privatisation programme has been debated for a decade. Until recently, however, it was assumed that the government would privatise only loss-making public businesses. This was partly because Article 44 of the Constitution of the Islamic Republic imposes almost insurmountable hurdles on selling public businesses. The virtual abolition of Article 44 is a major political victory for Ahmadinejad, something that his two immediate predecessors as presidents failed to achieve. His hands are no longer tied by the Constitution; Ahmadinejad is now putting up public businesses for sale that could be regarded as family jewels. Among these are 17 of the 32 companies that together make up the National Iranian Oil Company (NIOC), the nation�s single biggest holding corporation. At a time that the government is imposing gasoline rationing, the privatisation programme is offering key refineries, including those of Isfahan and Tabriz , for sale. This marks the start of a process at the end of which the NIOC could become an empty shell. Also for sale are four of Iran �s most profitable petrochemical businesses. Five major gas companies and the nation�s biggest gas refinery at Bidbolabd, which has been plagued by strikes, are also to be sold. A start has also been made to privatise the metallurgical industries, regarded both by the late Shah and the late Ayatollah Khomeini as �strategic�. The Khuzestan Iron and Steel Corporation is to be completely sold while an unknown portion of the giant Mubarakeh Steel Complex in Isfahan is also on offer. The programme further envisages the privations of the banking and insurance sectors, first nationalised in 1979. This will be achieved through public selling of shares in tranches of five per cent. The problem with all this is a total lack of transparency. No one knows how the businesses have been evaluated or who would be allowed to buy them. The suspicion is that highly profitable units would be transferred to elements from the Islamic Revolutionary Guard Corps (IRGC) and their bazaari partners organised in the so-called Islamic Coalition. The government�s own banks will then provide the cash needed to buy the businesses. Ahmadinejad�s garage sale may make a few thousand military men, mullahs and hajis of the bazaar immensely wealthier than they are today. But it is unlikely to help solve his cash flow problem for any appreciable length of time. It might also anger the so-called �mustazafeen� (the dispossessed) whom he has tried to court. Along the roadways of southern Lebanon, thousands of banners festoon street lights and utility poles. They feature a distinctive symbol, a red inscription from the center of Iran's flag, protectively swathing Lebanon's iconic green cedar. The emblem belongs to the Iranian reconstruction organization. Its presence delivers a message that is not lost on critics of Iran's role here, nor supporters who have watched cratered roads filled in, damaged school walls resurrected and life return to some semblance of normalcy over the last year. Other countries "have reconstructed everything: the schools, the buildings, the roads," said Nazim Khanafer, a 47-year-old building contractor in Ainata, a town ruined in the war between Israel and the militant group Hezbollah a year ago. It is now being rebuilt with the help of Iran and other countries. "They have paid money to the people, unlike the government." Hezbollah Secretary-General Sheik Hassan Nasrallah, speaking Tuesday via giant screens placed in a south Beirut square, declared that his Iranian-backed group had spent $381 million to provide temporary shelter for 25,000 families, restore infrastructure and buildings and revive the economy. He accused the government of slowing down payments of $1 billion it had collected from international donors. News story says that $35 billion in oil money has gone missing in Iran as reported by an Iranian news agency. You want to read this. In a shocking report, the chief auditing office of the Iranian parliament says that tens of billions of dollars in oil revenues from 2006-2007 have vanished. According to Iranian law, this money should have been paid by the government of President Ahmadinejad into Iran�s central bank. Once there, the government can request the withdrawal of funds for projects, depending upon the approval of the Majlis. However, the new investigation shows that the government never paid the money into the central bank, and no one knows what has happened to it. Although it has not yet been proven, many suspect that the money has been used to finance corrupt activities of politicians surrounding the president, or the president himself. After all, it is very unlikely that this could have happened without his knowledge. This is a serious allegation, as this amount constitutes almost half of Iran�s total oil income for that year. To make matters worse, this is not the first time since the start of the presidency of Mahmoud Ahmadinejad that money has been used without the Majlis� knowledge. One other famous case took place during the 2007-08 financial year. It was revealed later that $2 billion was used to import gasoline, without any consultation or approval of the members of the Iranian parliament. It would be an understatement to say that President Ahmadinejad had a rocky relationship with the previous Majlis, whose term ended on May 27. Members were so fed up with the president�s efforts to sideline them that they tried to reduce his presidential term on two separate occasions. Although they failed, such an undertaking had never before been attempted in the history of the Islamic Republic. As well as Ahmadinejad, the other person whom former Majlis members held responsible for their frustrations was Majlis speaker Gholam Ali Hadad Adel. This powerful Iranian politician, whose son is married to supreme leader Khamenei�s daughter, except on one famous occasion continuously defended Ahmadinejad from the Majlis� complaints. The new Majlis, which was sworn in on May 28, decided to take no chances. Realizing that the president is unlikely to change his ways and that they cannot change him, members decided to do what is second best, by choosing a new Majlis spokesman. He is none other than Ali Larijani, Iran�s former top nuclear negotiator. Larijani also happens to be a powerful political rival to the president. He ran against Ahmadinejad in the 2005 presidential elections. The election of Larijani could pose several problems for the president. First and foremost, the relationship between the two is not good. In November 2007, he resigned from his job because of Ahmadinejad�s uncompromising attitude towards the nuclear program. This made Larijani�s efforts to find a diplomatic solution to Iran�s nuclear program more cumbersome. Eventually Larijani gave up because he could no longer work with him. Now that he is back in another important political post, it is likely that he will use it to boost his image, and to try and weaken his rival, in order to bolster his chances of election as president. This is already apparent. The news regarding the missing $35 billion came out on the day Larijani was sworn in as speaker. One year is a long time in Iranian politics. One of Larijani�s weaknesses has been his lack of experience in management of domestic affairs. Unlike Ahmadinejad, he has never been mayor or governor. His new post is likely to strengthen his position domestically. If he plays his cards right and manages to convince Supreme Leader Khamenei that he would be a more suitable replacement for Ahmadinejad, then the international community may find Iran of 2009 an easier country to talk with.